Nobody's seen that before? Glad I posted it then! Have changed title accordingly. Should I sticky it? Got a lead lamp with an incandescent bulb in it? steve_earwig wrote: Got a lead lamp with an incandescent bulb in it? Yep, usually within a foot or two of where I'm spraying brake cleaner! I stickied it (top of the General, that ok?) I forgot to include the warning label that was along with the article, I'll shove it on now 'cos it says it all. f*ck thats scary, i never noticed, i shall take more car with this smoke off the soldering iron. i once walked into a mushroom house, they were disinfected with Formaldehyde, i just opened the door, and looked in and instantly kicked myself away from the door, my eyes stung like mad, and i just fell on the ground, couldnt see for a few seconds. not nice stuff at all, good its not used any more. the thing is, isnt all the fluids in a car all real bad for you, i put gloves on, because i hear some oils can make their way in through the skin. 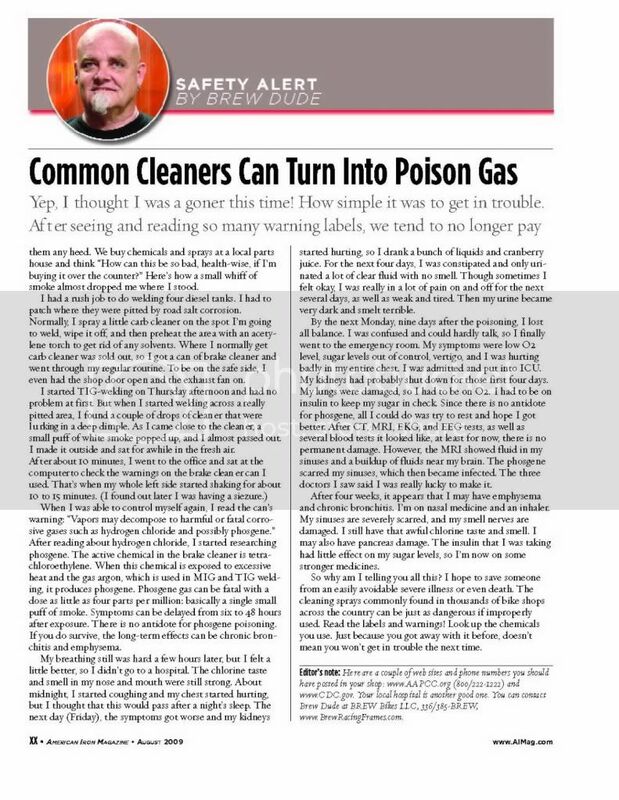 I'm not sure how you got from brake cleaner to solder but yes, the vapour that comes off hot flux is indeed toxic (I remember all the warnings at work when they realised ). I got this off a bike forum, further down someone mentioned chain cleaner was more or less the same. 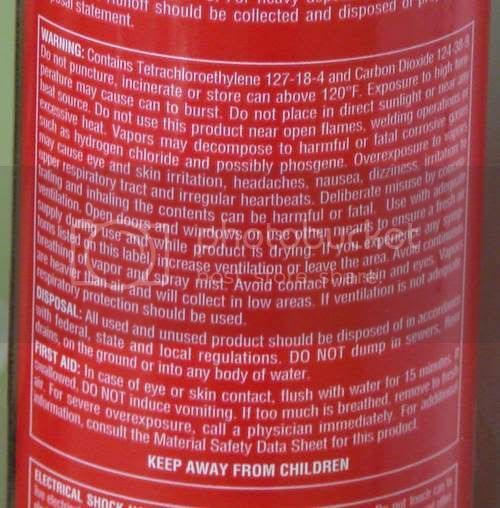 Used engine oil is carcinogenic and can cause dermatitis (personal experience), you wouldn't want to get brake fluid in your eyes, don't drink antifreeze etc. etc. There is stuff to be worried about but in these days of totally stupid paranoia, where you need to carry out a risk assessment before getting out of bed in the morning and CORGI accreditation before opening a window, it's very easy to get overloaded with it all. its easy to go ott on stuff, but on brake cleaner this should be included on the back, ie the mans story.